You’re in front of your class, having just introduced a complicated grammar point, perhaps the present perfect tense. You’ve just taken the students through some guided practice and are about to give out the second handouts for independent practice. It is only then you realize the handouts aren’t on your desk. They aren’t on the podium, either, nor on the table. Where are they? As you frantically search, you are aware of the students breaking into little conversational groups; there are scraps of various languages, a burst of laughter. Oh, no! It’s the dreaded transition! When you locate the handouts a few moments later, it takes ten minutes to get the class settled down again and back on task. Transitions, those instructional moments in which the class moves from one activity to another, are fraught with opportunity for mishaps like those portrayed here—needed materials go missing; students forget what they should be doing, and so forth. The transition can be at a huge time drain, or even worse, the force that derails an entire class period. However, with some planning, the instructor can guide students from one part of a class to another with ease so loss of instructional time is minimized. If the teacher plans every moment of instruction, including the transitions, he is more likely to stay with the plan rather than get swept up by the digression of an awkward transition. If students take the opportunity of the pause of going from the reading to the writing activity, for example, to start chatting with their cute seat partners, the teacher can move in and gently remind them, “We’re working on writing now, so you should be getting out your portfolios.” If the instructor is unsure of what he wants students to do, however, or hasn’t planned, students will quickly sense that and go on with their conversation. If the plan is on the board, both teachers and students are likely to stick to it. It’s suddenly tangible and real, not something ephemeral that exists only in the teacher’s mind. So if the teacher has to go to the door to answer another teacher’s question, for example, students can look at the board and say, “Oh, we’re supposed to be on page 72 now.” And if a student wanders in late and asks, “What are we doing?” the teacher need only point at the board. Writing your plan on the board is part of teaching your instructional routine. Students should, both explicitly and implicitly, learn the typical activities of the class and how to transition, such as how to get into groups with minimal disruption, where to look for supplies like paper and textbooks, and where to get necessary information. If students are taught the routine from the start of class, there will be fewer students saying “What are we doing?” or, worse, “I don’t know what to do, so I’m just going to sit and talk with my friends.” And if a student does forget and asks “What are we supposed to be doing?” another student will probably point to the schedule or supplies more quickly than you can. Teachers should keep both regular activities for transitions as well as specific daily ones. These might be as simple as proofreading an essay coming due—a regular activity, which students know they can do when the teacher Is setting up the DVD equipment for the video they’re about to watch—or specific daily activities, such as looking ahead to the assigned reading. Instill in students the value of not wasting time, and instead of sitting at their desks with their hands folded as the teacher struggles with electronic equipment, they can get some of their own work done by reading ahead in the homework. Because those transitional moments when the teacher’s attention is focused on something else seem to be a time when students develop the need to chat with each other, give them a legitimate purpose to do so. If you’re busy at the beginning of class trying to locate that section in the textbook you just had, tell students to catch up with three peers on what they did over the weekend and to focus on their past tense verbs because you may ask them about what their friends did. Or keep a set of conversational cards, with topics like “the weather” and “sports,” on your desk in a box and tell students to select a card from the box and hold a conversation with their peers. Finally remember to remind students of your boundaries. Sometimes, even if you have done all of the above to handle transitions, there are still those students who seem to seize on the moment of seeing you rummaging through your desk for the missing dry erase markers to come up to you and begin telling you their story on why their homework isn’t complete. It’s fine to tell the student, “I want to hear you, but I want to give you the attention you deserve. Let’s speak after class.” This begins to teach the student about appropriate time and place. Transitions, in class as in life, are not easy. But with planning, making the plan transparent to students, teaching students the routine and value of using time wisely, the disruption caused by transitions can be minimized. 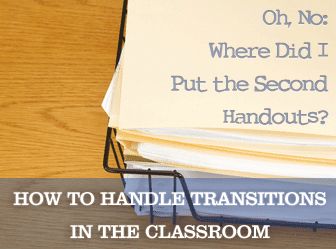 Are your classroom transitions ever awkward? What are some ways you address them? Posted by Rallia at 8:35 π.μ.